The Band Lookup add-on provides Limit Up/Limit Down price bands for affected securities across all tapes. Nasdaq TradeInfo is an easily accessible web-based tool that allows users to access all of the order and execution information for their entire firm, for both Equities and Options, through one interface. TradeInfo users can see the status of orders, executions, cancels and breaks and can mitigate risk by having the ability to cancel open orders. To view a variety of trading data, users can generate a several different types of reports such as execution reports, which are available for download. To avoid support delays during unforeseen technical disruptions, simply log into TradeInfo through a secure web browser to access the easy-to-use order and execution management tools. 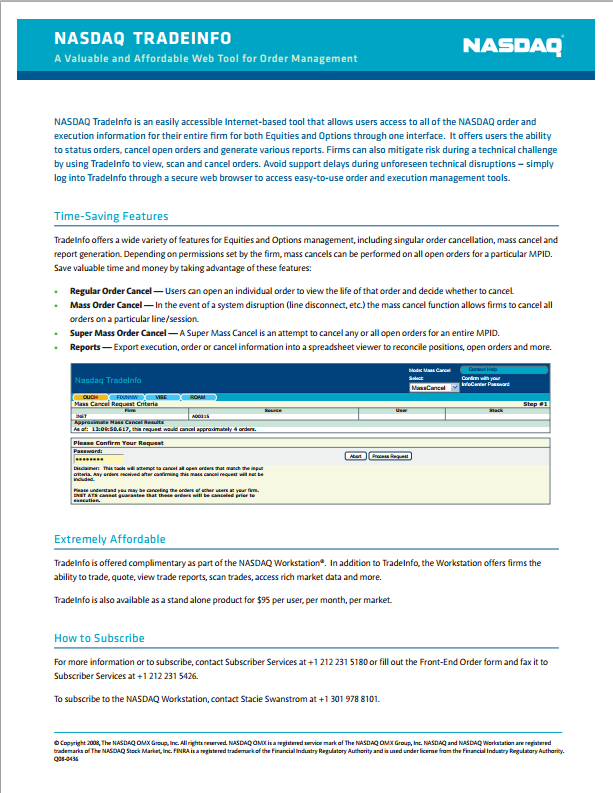 TradeInfo is offered complimentary as part of the Nasdaq Workstation or as a as a stand-alone product for $95 per user, per month, per market. Effected May 1, 2013, the Band Lookup add-on feature is $200 per user, per month.